Every grand lady gather her traits from her ancestors...various parents and grandparents contribute their share of charm, elegance, wit and steadfastness. So it was with the Silver Lady. Robber barons George and Jay Gould forged a transcontinental rail system with the Western Pacific, Denver and Rio Grande and Missouri Pacific, and launched the system's first through-car equipped transcontinental train, the Atlantic Fast Mail. Soon followed the Scenic Limited, which began the tradition of highlighting the West's grandeur. With the upcoming 1939 San Francisco Golden Gate International Exposition on the horizon, the WP, D&RGW and CB&Q management began talking of a special edition of the Limited, and the train metamorphized into the Exposition Flyer. This train enshrined the moto "The Scenic Way Across America" and was an instant success. Meanwhile, the Burlington was on the cutting edge of technology and introduced their Zephyr (later known as the Pioneer Zephyr), a revolution in streamlined, diesel-powered passenger trains. From this little three-car articulated train came a legacy of the Burlington's Zephyrs, which the CZ was but one of many. And then there was Mr. C. R. Osborn, General Manager of GM's Electro-Motive Division. Riding through Colorado's Glenwood Canyon on Independence Day, 1944, in one of his Company's new diesels, he was struck by how dramatic the scenery appeared from his perch in the cab of his F-unit. When a man in his position gets an idea, it gets accomplished, and thus the Vista-Dome car was born. The first was rebuilt from a standard Budd chair car, and was an instant success. GM's Train of Tomorrow touted several of the gleaming beauties on its tour of the country, and soon they became a hallmark of the Burlington's Zephyr fleet. With the amazing success of the Exposition Flyer, and the wonderous new technology on the horizon which the Pioneer Zephyr only hinted at, plans were soon churning to re-equip the Flyer with a new streamlined consist. But times were hard, money was short, and the plans were postponed, only to be further interrupted by the World War II and the desperate need for vital material resources to be dedicated to the war effort. The Flyer still ran, now as a conduit for troops, sometimes in as many as eight sections. And at long last, victory overseas was at hand. Due to increased revenues to the nation's railroads generated by wartime freight WP's financial state was much better. With wartime restrictions lifted on non-vital materials and services, the door was now open for actual creation of the California Zephyr. Partnership agreements were reached between the WP, D&RGW and the Burlington, and the initial orders were placed with Budd Manufacturing Company. It was decided that each train would contain five dome cars in each consist, more dome cars than in any other name train. It was also agreed that each car would be named following the CB&Q's practice of naming its stainless steel trains, which called for each car name to be preceded by the word "Silver". Seventy-seven "Silver" names would eventually be used in naming the Zephyr's cars. The order, placed in October of that year, specified six ten-car trains. The number of cars per train was increased to eleven early in 1946. This would later be altered again, with the final consist containing thirteen cars per train. On Saturday, March 19th, 1949 the California Zephyr made it's only appearance in San Francisco proper. Situated in front of the Pier 3 Ferry building on the Embarcadero, the Zephyr proudly stood waiting for it's official inauguration ceremony to begin. As sunlight gleamed off the stainless steel cars, the ceremony was begun, Soprano Evelyn Corvello of the Pacific Opera Company opening with the Star Spangled Banner. San Francisco Mayor Leland Cutler then gave a welcome address. 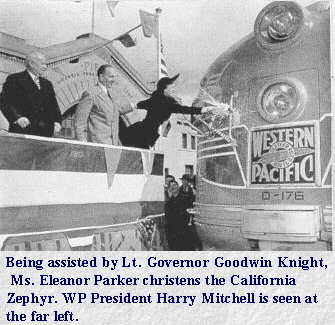 Western Pacific President Harry A. Mitchell presented the California Zephyr to California Lieutenant Governor Goodwin Knight who accepted it "on behalf of the People of California." Christening ceremonies were then performed by Warner Brothers Studio actress Eleanor Parker. 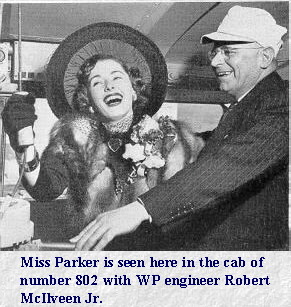 Breaking a champagne bottle over the nose of WP F3 number 802 she declared, "I christen thee the California Zephyr." The next day, March 20th, the California Zephyr was officially inaugurated. Service was offered between San Francisco, California and Chicago, Illinois. Through-car service from Chicago to New York City was provided via the Pennsylvania and New York Central railroads. West bound trains would be numbered 17, while the east bound trains would be numbered 18. And though it is little known, a sixth railroad participated, with the Santa Fe providing bus service to passengers between Oakland and San Francisco in later years. 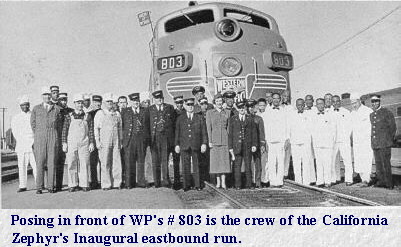 The first eastbound run would begin at 9:30 am PST the following morning on March 20th, 1949. Every female passenger onboard was presented a lavish corsage, of "silver" and orange orchids flown in from Hilo, Hawaii for the occasion. To add to the festive atmosphere, the Western Pacific Employee Band was present to supply music for the departure. Thus a legend in passenger train history was born. The route of the California Zephyr covered 2,525 miles and took an average of 2 ½ days to complete. The CB&Q handled the train from Chicago to Denver, Colorado where it was then handed over to the D&RGW. The D&RGW would then handle it until reaching Salt Lake City, Utah where it was received by the WP for its final leg into California. Scheduling intentionally placed the trains in the grandeur of the Feather River and Rocky mountains during daylight hours, while the Nevada deserts and plains states were crossed at night. This practice allowed passengers the most breath taking views of the route during the daytime. In 1962 the California Zephyr began to show signs of becoming a serious financial liability. Travel by rail had slowly begun a downward spiral. Airlines and bus routes had begun to make serious cuts into rail travel by offering faster or cheaper methods of transportation to the traveling public, though neither offered the opulence or service afforded to the rail passenger. By 1965 a request was forwarded by WP to the Interstate Commerce Commission (ICC) to terminate service of the California Zephyr. On February 14, 1966 the ICC denied the application and ordered the train to remain in service for one more year. 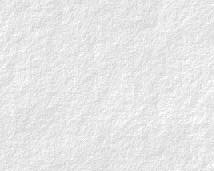 On August 2, another application for discontinuation of service was filed. In 1968 the ICC again refused the application and on January 26th formal notification was filed to discontinue service on February 20th. The ICC postponed this requested date. Out of pocket losses for operating the California Zephyr now exceeded 1.5 million dollars per year. For the final time, an application was filed in 1969 and, on February 13,1970 the ICC released an order stating, "operation of the train was no longer required". The death warrant for the "Silver Lady" had been signed. Final operation of the train was made on March 22, 1970 with a west bound train terminating at Oakland, California. The California Zephyr had operated for 20 years and 2 days. Although the WP and CB&Q no longer operated passenger service under the banner of the California Zephyr, a remnant of the once-proud train remained while maverick D&RGW operated its Rio Grande Zephyr service between Denver and Salt Lake City on into the Amtrak era. This too terminated, though, when D&RGW passenger services were finally handed over to Amtrak in 1983. Amtrak currently offers passenger service under the name of the California Zephyr, though it follows a modified route from the original, and in the opinion of many a purist, Amtrak's version is hardly a fitting repository for such a rich name. Almost all of the California Zephyr's 77 cars remain in existence today, though most have been modified by their new owners. California Zephyr cars found themselves in the employ of Amtrak, AutoTrain, while others went into service on railroads in Mexico and Canada. A very small few found themselves in museum collections to be restored, or private ownership.